The personal trainer was highly qualified, experienced, passionate and dedicated. They were able to guide, teach and motivate me. They spent an hour a week putting me through my paces, and they devised a 10 minute sequence of exercises to do at home every morning and evening. But here's the thing: I have to do the work myself, they can’t do it for me. So if some days I do the exercises at home, and some I just can’t be bothered, after the 6 weeks if I didn’t get the results I wanted, do I blame the trainer? No. If I didn't do the work it's down to me, not them. Their program works, but only if you actually do it. If I didn’t get results, should the trainer stop advertising that you can get results in 6 weeks? No, because it’s totally possible. 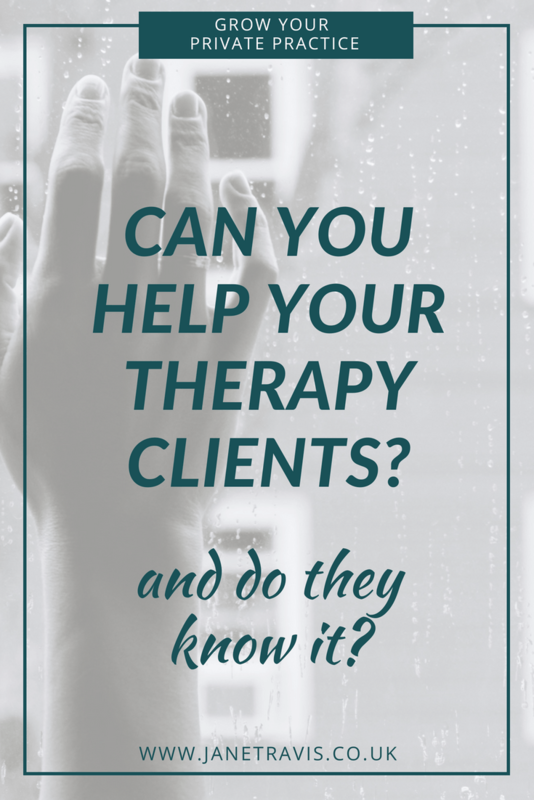 If therapy doesn’t ‘work’ for some clients, that’s no reflection on your skills as a therapist. If you allow it to become about you personally, you will lose confidence in your abilities, and that will have a detrimental effect on you and your self worth. Take a look at this post about therapist self care. If you lose confidence as a therapist and Imposter Syndrome hits hard, you’ll lose your ability to market your practice (read about therapist Imposter Syndrome here). You have to believe that you are able to help your clients and help them get to where they want to be otherwise, you won’t be able to put yourself out there. 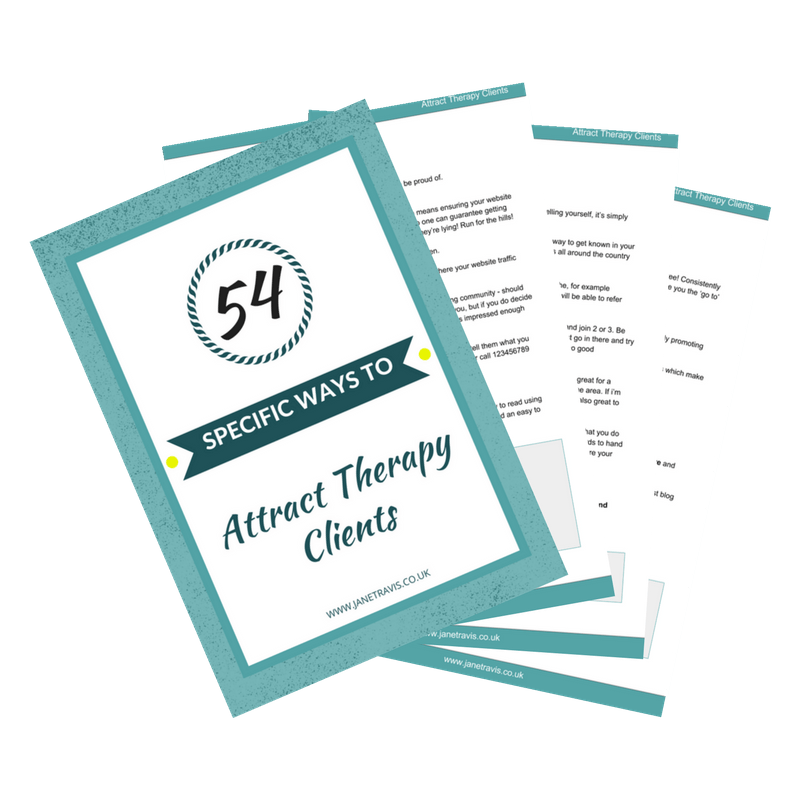 When it comes to running a private practice and attracting clients, we have to let potential clients know we can help them. Because if you don't, they will move on and find someone that does. Related post: Features Vs Benefits - what's the difference, and why it's vital you know. You are not responsible for your clients. It’s your responsibility to sit with them, counsel them and be the best therapist you can be. But what they do with that is down to them. For some, the process is too hard and they end the work early. Staying with the familiar is easier for them at that time and change feels impossible. For some, the time simply isn’t right and they don’t have the emotional space to engage fully in the process. Maybe looking closely at their life is just too overwhelming at the moment. But that isn’t a reflection of you as a therapist. Now, you may have a little voice in your head saying 'but Jane, what if it IS me?' sparking up your own insecurities, often bringing us to the ultimate 'am I a good enough counsellor/am I good enough'. But look, even Carl Rogers would struggle to work with someone thats not ready for change. This is something to be aware of and work on. Because there are people out there that need your help, and if you don't let them know you CAN help, that's not fair. You can't advertise promising results, of course you can't. You cannot and should not be promising things you have no control over. But think of previous clients, what was different for them on that last session? What positive changes had they made, both practical and internal? They felt better about... what? These are the things to highlight and let potential clients know you can help with. So be clear on your website, be clear in your blogs, be clear that you can help! And if you need more help marketing your practice, come join us in the Grow Your Private Practice club. Previous Post Grow Your Private Practice Club Next Post Do you feel overwhelmed marketing your private practice?